LIIMTED TIME: New members will receive a $5 credit for Classifieds advertisements!  Please review the rules HERE before participating in the Classifieds or Forums. 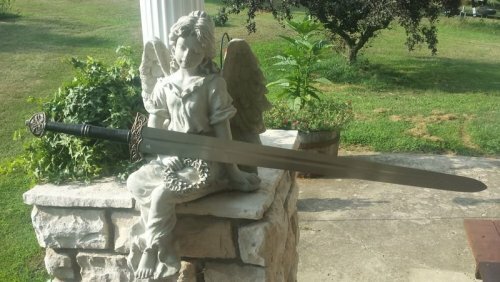 Up for sale, The largest sword I have ever and likely will ever make. This sword is basically a Templar Themed Claymore which was inspired by the sword used in the movie "Ironclad" This sword was a massive undertaking and the physical tole it took on my body was quite substantial. This build was partially a collaborative build with Tom Kinder Tom forged out the massive blade blank for me and did the heat treat as well. 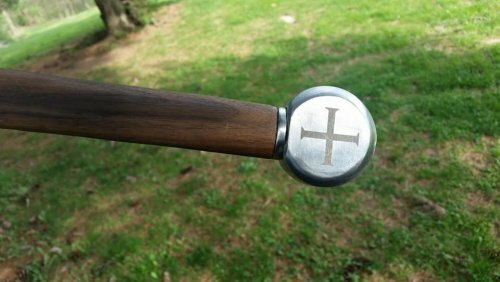 The sword features a walnut grip with 3 Steel spacers and a mild steel guard/pommel which have been laser etched. The blade has alot of distal taper and balances quite well. This thing even makes my Odinblade look teeny tiny. The sword comes with a leather wrapped wood core scabbard from Steve Huerta. Price is 2000.00 + Shipping/paypal. If you want a monstrous 2 handed sword from me this is your best chance to get one, if I had to make this again the price would be at least $3000 knowing what I do now after having made it. This is a hell of a bargain for a true one of a kind custom oldschool looking sword with a lot of hand made character. Specs: Blade Length: 42.25" Blade Width: 2.375" at shoulder Blade Width: 1.5" at tip Grip Length: 11.5" Overall: 57" Blade Material: 5160 Spring Steel Hilt Material: Mild Steel and Walnut Hilt Assembly: Keyed/Peened Weight: 5.5 lbs POB: 4.5"
Up for sale, my most prized possession, and the definitive unquestionably best 2 hand fantasy viking sword ever made. This massive 2 handed swords feels light, and agile, an aspect many fantasy swords lose when trying to make them so large. The blade is 5160 Spring steel and the fittings are bronze. This sword was my design which John Lundemo expertly took and made even better than I chad imagined it. The only reason I'm selling is because I'm saving up for a house and a fully equipped legitimate workshop to continue my own blade craft. This sword was cut with once, which is demonstrated in the video attatched to this sale thread so you can see how wonderful it wields and cuts. Price is 4200.00 + Shipping. Paypal friends and family or buyer covers goods and services fee. Specs: Blade Length: 34.5" Blade Width: 2.625" at base Blade Width: 1.5" at tip Grip Length: 9" Overall: 46" Weight: 3lb 12oz POB: 3.75"
Hello everyone, Since were starting with an empty slate here I would just like to introduce myself as well as my services. I figure this is the best place for it since I am a dedicated full time fixed blade knife and sword maker, I have no plans do do folders and such. 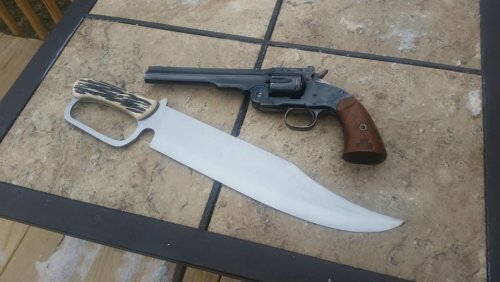 My real name is Wes Beem I'm 30 years old, been in the craft since around 2010, and been doing it professionally for about 5 years I specialize in mostly fantasy or tactical type blades but I also do classic designs. Bowies and Seaxes are my favorite type of knife both to make and own. I mostly work with 5160, 80CRV2, and 1075/1095 high carbon steels. I offer both through hardening and differential clay hardening. My blades are first and foremost performance pieces made as real world weapons/tools. Below are some examples of my past works, and don't hesitate to PM me to talk about a custom commission, my que is almost always open as custom orders are my primary source of income, in my off time I make some of my own designs to post for sale periodically which you will start to see here in the not so distant future. Founded in 2018, Bladehall is dedicated to preserving the art of the blade.